When you open a packet of lentils, do you check if any pebbles were left by accident in the processing facility? If you’re like most people, you probably don’t. After all, it would be unlikely to find a foreign object in the food we buy at the store. The fact that we feel safe enough is a sign that the industry has gone a long way in terms of safety protocols and procedures. wear and tear of equipment and tools, leading to physical contamination of the products with e.g glass, steal or stones. From farm to table, food’s life cycle goes through many phases, and incidents can happen at any step of the way. Because of their complexity, processing facilities are particularly exposed to the risk of contamination, and that’s why a tried-and-tested cleaning and sanitation procedure is essential. However, where should you start to put a new one in place, or improve the one you already have? In an effective food safety protocol, there can’t be any cookie-cutter approach. Before even starting to clean, it’s essential to know what type of soil we are treating. In a food-grade environment, soil is best categorized by the type of detergent to use. The ideal cleaning agent is effective, safe for plant operators to use and won’t damage surfaces. The main choice will be between caustic and acid chemicals. Caustic are gentler on surfaces and are indicated to remove organic residues. For more resistant soils, an acid agent will be more effective, although it can have a corrosive effect. In general, caustic agents should be used for routine cleaning and acid agents for periodic cleaning. In a processing facility, the most common soils to remove are residues of fats and oils, proteins, carbohydrates and minerals. Each one needs its own procedure, although what makes a substantial difference is whether they are still fresh or have solidified into a crust. Fats and oils are easily removed with hot water. In a solidified state, a caustic detergent will be the most effective. Proteins. Their texture will vary depending on the temperature they’re exposed to and can be difficult to clean when they denature. However, as most allergens are proteins (like ovalbumin in eggs, casein in milk, gluten in wheat, etc. ), removing them is extremely important. Carbohydrates are not particularly difficult to remove. Fresh simple sugars can be dissolved in water, while hardened patches can be removed using caustic detergents. Minerals. Under certain conditions, minerals such as calcium, magnesium, iron or manganese become quite resistant. Additionally, salt can also cause corrosion. For the most difficult cases, the use of acid detergents may be required. Bacteria, yeasts and molds. These have different biochemical qualities, but one thing in common: when they harden they acquire a polymeric matrix, called biofilm. These encrusted plaques can harbor pathogenic bacteria (like those causing listeria), and shield them from detergents. With biofilms, an alternating approach with caustic and acid cleaners will be more effective. Limescale from water. In this case, acid agents will be most suitable. Limescale formation can be easily prevented by keeping water hardness in check. Algae and fungi. They thrive in moist areas and can be removed with acid agents with a strong oxidative action. In the list, we can also include corrosion from non-stainless metals, rubber marks, and adhesives inks and dyes. Having to deal frequently with these types of soil probably means that the materials being used are not appropriate for a food processing environment. In any case these types of soil have specific cleaning procedures that are not part of a food-grade cleaning protocol. Chemical activity. It comes from water and especially detergents. Type and quantity will depend on what detergents we’re using and in what concentration. Thermal energy. Heat – usually from how water or steam – increases the amount of chemical reactions. Mechanical energy. It’s the main type energy at work with brushes, water jets and in the internal turbulent flow generated during clean-in-place. Time. Some cleaning methods need more time or less time for chemical reactions to occur (soaking is a good example). Proper cleaning always combines all four parts of the Sinner circle and of course is followed by a sanitization step. The base for an efficient food safety practice is designing a thorough validation and verification protocol. It’s a written document that describes in detail how to achieve cleaning and sanitation prerequisites in the processing plant, and how to verify the efficacy of cleaning practices. Is the equipment we are using fit for the intended use, and what does the manufacturer documentation say? Does it have to be partially or totally disassembled to be sanitized? What’s the optimum level of sanitation for the type of food we process? Is it for special categories of consumers like infants, the elderly, or people with allergies? When should the cleaning be done? What types of soil are we cleaning? What cleaning agents should we use for each type of soil? Who oversees cleaning and sanitizing? What are their specific tasks? Are there any surfaces that are difficult to clean or reach? What are the worst-case scenarios and how do we deal with them? What are the optimal chemical properties of the cleaning water? What test should we carry out, to verify if food-grade sanitation was achieved? The questions above will help create the prerequisites for high hygiene standards. What comes next are validation and verification. Here, the two main questions are: is there any part of the procedure that we need to improve? And how do we determine any corrective actions? Even when validation is successful, the protocol won’t be set in stone. Once standards are achieved they must be maintained, so the validation should be re-done periodically. Also bear in mind that with any change in the production process, your protocols will need to be reassessed and modified accordingly. There are two main phases in food-grade hygiene: cleaning and sanitation, and they need to happen in this exact order (you can’t disinfect dirt). With the proper use of detergents, cleaning eliminates up to 90% of organic and non-organic soil and dirt. Sanitizing will complete the process, removing the last small bits of remaining soil with disinfectants. The two main cleaning methods in the food industry are clean-in-place and manual cleaning. CIP is a mechanical procedure for sanitizing the interior surfaces of equipment (pipes, tanks, filters, etc.) without any need to disassemble them. The food industry was the first to adopt it in the 1950s, and over time it became an invaluable practice of cleaning protocols in all sectors that require high standards of hygiene, such as bio-tech and pharmaceutical. it can be fully standardized. presence of blind spots where chemicals, bubbles, soil and debris can accumulate and become stagnant. Ideally, every piece of equipment in a processing plant should be CIP-enabled. In real life, that’s not always the case, the main obstacle being the initial investment to substitute or adapt old equipment. Whenever clean-in-place is not possible, operators will have to manually remove all parts and clean them separately. This procedure is called COP, or clean-out-of-place. If COP is the only option, then the machine should at least be easy and safe to disassemble, clean, and reassemble. For clean-in-place, the reference for validation will be the water that comes out of the final rinse. If the goal of the sanitation procedure is to eliminate all allergens, then the standard in the food industry is the ELISA testing. Allergic reactions happen when the body perceives certain molecules contained in food as dangerous (for example wheat or peanuts) and starts attacking them with antibodies. The ELISA testing (enzyme-linked immunosorbent assay) reproduces the same immune response by applying specific antibodies to a post-cleaning sample. If a reaction occurs, then the surface is not entirely allergen-free. On the other hand, the bacterial load of rinse water is measured through total plate count, which quantifies the presence of biologically active bacteria, fungi and yeast. Whenever tests detect the presence of unwanted allergens or bacteria, CIP must be repeated until rinse water comes out clean. If the problem persists, the CIP approach needs to be re-designed in terms of processing parameters and potentially even physical design. According to the guidelines of the European Hygienic Engineering & Design Group (a non-profit consortium whose mission is to determine standards and procedures in food processing equipment), there should be at least three successful runs of the procedure to consider it validated. The results of the validation should end up in a written report. Perhaps, the biggest limitation of clean-in-place is that it can only be used with interior surfaces. For other areas, manual cleaning is the obvious choice. Other than type of soil and detergent, the most suitable manual method depends on how we choose to apply the detergent on a particular surface. Foam cleaning. This method is quite effective and safe especially for large areas. slowly than water, it mainly employs chemical energy and is easier to apply. High-pressure water. It uses a combination of thermal, chemical and mechanical energy. The risk of using high-pressure water is that it can create aerosols, small droplets that float in the air and can contaminate adjacent areas with chemicals and bacteria. For this reason, it should only be used when foaming is not applicable and only by trained personnel. Manual application. Applying the detergent manually requires the classic elbow grease with the use of brushes, mops, cloths etc. Here, mechanical and chemical energy will be mostly used. This cleaning method cannot be entirely eliminated, although the processing environment (equipment design, production organization etc.) should be set up in a way to reduce it to a minimum. Fogging. Spraying a mist of disinfectant solution eliminates airborne microorganisms. However, fogging should be used only when necessary, and never as the main sanitation method. Time and chemical energy have a main role here. Machine washing. Whenever other cleaning methods are not applicable or inconvenient, and a mix of chemical, thermal and mechanical energy are needed, using specifically-designed washing machines can be the best option. There are several factors involved in this choice, such as investment and operational costs, maintenance, and appropriate usage. The two most widely used tests for manual cleaning are ATP and riboflavin. ATP testing. Adenosine Triphosphate is the enzyme that carries chemical energy around living cells. The presence of ATP on a surface indicates that there’s life, and in a food processing environment “life” also means potentially dangerous microorganisms. With this type of tests, first a sanitized surface is swabbed. The sample is then activated with an enzyme called luciferase (the one that makes fireflies glow in the dark). The amount of light that is produced by the reaction (measured with a portable device) will be a direct indication of the amount of ATP. The effectiveness of ATP testing is also its limit, meaning that it will be ineffective with non-living cells, such as yeast extract. Riboflavin testing. External surfaces and the interior surfaces of equipment (whether CIP-enabled or not) can always have blind spots the detergents cannot reach. Also, there can be difficult areas that tend to be left behind during manual cleaning. Riboflavin (known as vitamin B₂) is a quick, effective and food-grade way to uncover them. Before cleaning, the whole surface or at least the difficult to clean part of the surface, is sprayed with a riboflavin and dye solution, which becomes fluorescent under UV light. After the cleaning is done, the operator will check with a UV lamp if any areas remained untouched. Food-grade tests are not confined to specific sanitation protocols. For example, ATP testing can be also used to validate the bacterial load of CIP rinse water, while ELISA strips can be quite effective to test the presence of allergens in a manual cleaning scenario. No matter how good you optimize your food safety practices, they will cost money and take time. However, the cost of not doing it properly can be much higher. As we said, optimal hygiene levels are based on the validation and verification protocol, but they require more than that. Food industry operators must create a culture of food safety within their companies through constant training, whose focus is not only the on “what” and “how” but also on why high hygiene standards are necessary. Also, it should involve all personnel, and not be limited to the people in charge of cleaning and sanitation. the production schedule will have a direct influence on your hygiene levels. To avoid allergens cross-contamination, it will be particularly important to consider what type of food to produce, and in what areas of the plant, and to keep those areas well separated. Of course, it remains always best to keep everything as clean as possible during operation, which comprises fixing leaks and always trying to keep floors dry in food factories. Another important aspect to remember is to visually inspect equipment which has been stored for a while and sanitize it before use if there is no visual soil. If it is dirty if of course needs to be cleaned before sanitization. Become a Food Safety Expert! Join our FREE on-line webinar this week! its really a nice informative article. I would love to read article on shelf life of different food categories. Dear Shruti, thanks for your comment. We will look into writing an article on shelf life! Thanks a ton for sharing the wonderful post on cleaning validation in the food industry. Can you suggest me some professional experts to buy the chemicals for my food industry? Thanks. Very informative and easy to understand. Thank you for explaining the difference between a caustic and acidic agent. I see the labels at the store, but I don’t know what they mean because they never explain it. We are getting ready to clean our basement and I wanted to know which detergents were best for the heavy-duty stuff. 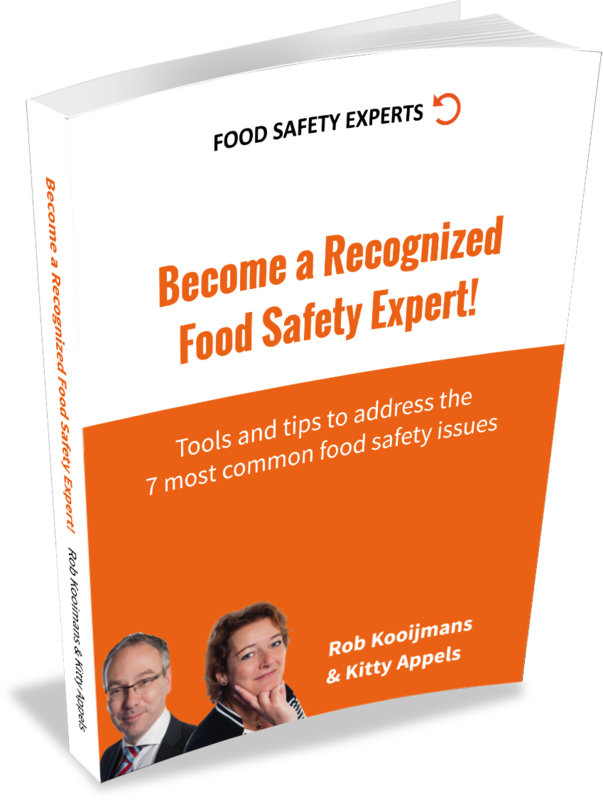 Become a recognized Food Safety Expert! Download a FREE copy of the e-BOOK now! Fareway Chicken Salad Salmonella Outbreak: How Do Pathogens Get Into Ready-to-Eat Products?